The story of GSD Superman - Here's a great story sent in by one of our readers about her families own experiences with German Shepherds. I'm sending two pictures of one of my GSD. His name is Superman. He got his name because my 3 year old son was very afraid of dogs. So one day I spoke with a breeder and asked him if I could take my son to see the new born pups that he was advertising. I took my son and when he saw the puppies, he immediately fell in love and I told him that that particular breed of dog, were superheroes, because they would protect him, guard the house, play with him and never harm him.... so, He asked me if we could keep him. Of course I said yes, that being my intention all along. When I asked him what he wanted to name him, he immediately responded... SUPERMAN. They have been best of friends ever since. 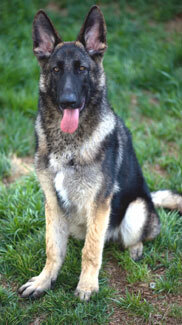 When superman was 7 months old, we purchased another GSD, this time, a female so that they could be life partners. Her name is LANA. They are both amazing dogs and my family loves them very much. Superman is now 8 months old and Lana is 3 months. They get along great and play together and do everything together. I will send you in another mail pictures of them together and of Lana. Thanks for the web page that is great. Thank you so much for sharing your great story about rescuing your new German Shepherd puppy Superman. And I'd like to take the time to say thanks to all our visitors for reading along with us. If you get the chance, please come back often to see what else is going on in our growing German Shepherd Dog community. BTW, please tell us also exactly what you think about the above story by leaving some interesting comments below. Thanks for visiting us here at Total German Shepherd.